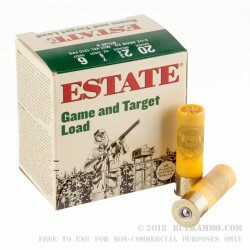 This 20 gauge ammunition from Estate is sure to satisfy clay and upland bird shooters with its strong balance of power and recoil. 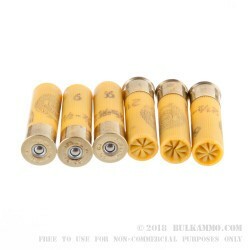 These shells are affordable for high-volume use while maintaining a high standard of quality. Each 2-3/4" shell in this box of 25 fires a 7/8 oz. 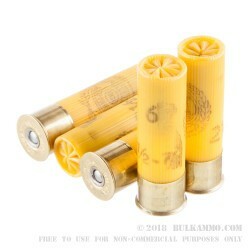 payload of #6 birdshot at a muzzle velocity of 1,210 feet per second. This is a medium power load that does not produce too much of a kick but produces good patterns at medium range. #6 shot is on the larger end for birdshot loads and provides better penetration against larger clays and birds at the cost of a slight reduction in pattern density. 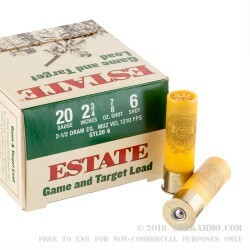 Estate ammunition is loaded by Federal of Anoka, Minnesota; established in the 1920s, Federal is one of the nation's top ammo manufacturers and operates as a division of the Vista Outdoor group. Other brands in the Vista family include Speer, CCI, Blackhawk, Weaver, Hoppe's, and Bushnell.